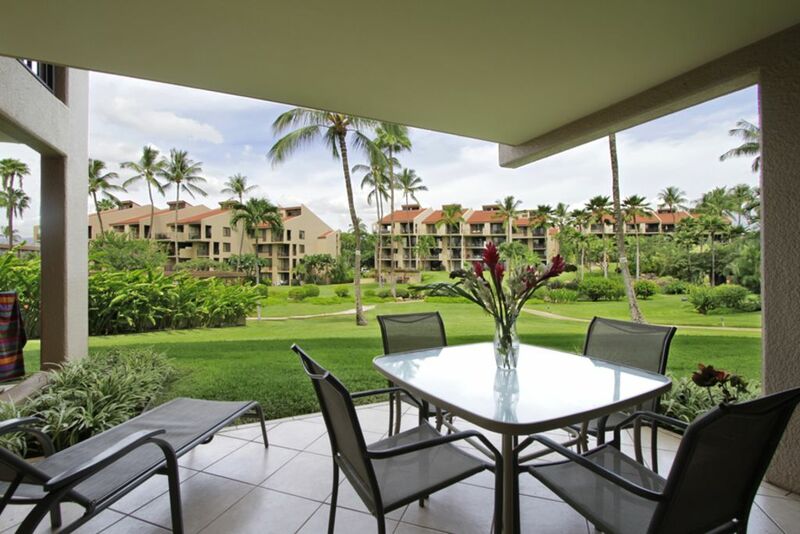 Steps away from Kamaole Sands guests can stroll along golden beaches and enjoy an ocean full of water sports. Snorkeling, sailing, scuba diving and whale watching adventures await. Shopping and restaurants are walking distance away. Minutes away are five world-class golf courses. In addition to its optimal location, this lovely resort offers a large swimming pool, sundeck, two jet spas, a wading pool for small children, four free play tennis courts, and outdoor picnic areas equipped with gas BBQ grills. Weekly Mai Tai parties with Hawaiian music. Full activities desk and 24-hour front desk on-site. Quiet hours are from 10pm - 8am and there is 24 hour security. *** We have baby and children items available at a small fee. Please request prior to arrival. This one bedroom ground floor (Sleeps four), two bath condominium with remodeled kitchen and bathrooms is great for families or couples. It has amazing view of the tropical gardens and close to the BBQ area. Unit have complete kitchen which includes: electric stove & oven, refrigerator/freezer with icemaker, microwave, dishwasher, coffee maker, toaster, blender, etc. Units are fully equipped with chinaware, glassware, silverware, pots, pans, cutlery, etc. Kamaole Sands is located in South Kihei within a few blocks of Wailea. Its walking distance to shops and restaurants. Kam III beach is directly across the street. We are happy you enjoyed your stay with us. We like to check in our guest to see if they have any questions and make sure they are enjoying the time. I have rented vacation houses and condos throughout the U.S., Mexico, and Europe for many years and I am sorry to say that this was one of the worst. A couple of days into our stay I began to expect that if I went to turn something on or look for something, it would be broken or missing. The biggest issues were that on day 2 the air conditioning unit in the bedroom stopped working, and the hot water supply was unpredictable (sometimes you would get hot water in the shower, sometimes you wouldn't). I called the property manager and never received a call back, which is unacceptable. I have also never rented a beach house/condo with absolutely no beach equipment/toys. Is every renter supposed to buy umbrellas, beach chairs, boogie boards, sand toys, coolers, etc.? What happens to the stuff people leave behind, are the property managers throwing it all out? Light bulbs were burned out, no soap in the showers, broken bottle opener, hand soap that had separated into gross looking layers of who-knows-what, etc., etc. In addition, there was no binder or book with instructions, menus, phone numbers, etc. - a first in my vacation rental experience. The weirdest part was that when we arrived at the appointed time to check into the unit, the cleaners were still there along with a woman with a clipboard who deemed the unit good to go. What the heck was she checking off? This complex is in a nice location and the pool is nice (although hot tubs are hot only periodically - check first), so I would stay in this complex again, but you can find a much nicer/better maintained unit for the price. In Response to your review. Thank you for sharing your review about your stay with us. I have to say after reading this review I found it to be very confusing and upsetting. We have been owners and doing vacation rentals at Kamaole Sands since 2003. This is by far that worst review we have received in the 13 years we have been doing rentals. As an owner we do appreciate your comments and suggestions as we are not there physically and depend on our property management and housekeeper to be our eyes and keep our property maintained. I would like to address these issues as stated. Air Conditioning. We apologize that this was a problem. This has been resolved. Hot Water Supply. I spoke with guest before you and after and they did not seem that there was an issue with the water. Property Management. I spoke to the one of the owners of Rentals Maui and he went through all messages and calls for that day and did not see a message. I’m not saying you didn’t call. Maybe one more phone call or calling us direct we could have fixed the problems while you were out enjoying the beach. Beach Equipment. Our check-in instructions which were sent to you states that the beach equipment is located in the lanai closet. You said that it was locked. Again I asked the guests before and after you and they said everything was in place as promised. The door sometimes can get stuck you just have to push a little. We apologize that the cleaners were still there when you arrived at the 3:00pm check-in time. They were done at 3:15pm. They did let you put your grocery items in the refrigerator. There is an inspector that does do a check-list to make sure everything is cleaned properly and does check at all lights are working. We will make sure that we create a better check list so we can be sure to cover all of the spots we sometimes miss. Again we are sorry that our condo did not meet your expeditions. We have many repeat guest that book this unit yearly. We will be there at the end of this month and will be doing a major inspection to make sure that our guest will be completely satisfied. Excellent stay beautiful condo very well maintained look forward to next year. Thank you. We are so happy you enjoyed your stay with us. Please come back and see us. We loved the unit, the amenities, and the location. All the extras (condiments, supplies in the kitchen, toys for the beach) that the owner provides were much appreciated. We have stayed in KS more than 12 times, and this was the best ever. My husband stayed at the unit for over 2 weeks & really enjoyed it. The locaction is perfect - views of ocean, the lawns/water features & hills. Easy walk to beach and many restaurants. The unit is quiet, very well appointed and clean. Really appreciated the variety of spices, cooking utensils, some paper products and cleaning products - makes it easy to settle right in. . A few little things - needs a few more wine glasses & tea towels & updated bath mats & shower curtain. Overall - very nice spot to spend in Maui paradise.